Hi, this time we have list of of apps for famous RIM phones. We are sure you will enjoy shopping on these smartphones. And just if you are into iPad apps, we have a shopping app list just for you. 1. eBay byResearch In Motion Ltd.
Stay connected to everything that’s important to you on eBay with the eBay® application for BlackBerry® smartphones. Search, watch, bid or buy. Get reminders in your BlackBerry calendar when a listing is about to end, enjoy near real-time alerts when there’s another bid or you’ve won or lost an item, and pay for an item using your BlackBerry smartphone. As a seller, you can watch and review your sale items and enjoy communications made easy with the ability to respond to a buyer’s questions. The eBay application for Blackberry smartphones makes it easier than ever to follow the action and close a sale – even when you’re away from your computer. ScanLife turns your camera phone into an all-in-one bar code reader so now it s easier than ever to quickly access websites, product pricing & more. Scan Datamatrix, EZcode, QR and UPC! The easiest way to manage your family’s grocery shopping – and it’s FREE! OurGroceries automatically keeps your family’s grocery list up to date with the latest changes – on every family member’s mobile phone, and our website. Nearly out of milk? Add it now on your phone and your partner can pick it up on their next shopping trip. Every change to your shared shopping list is visible within seconds on any other BlackBerry® smartphone, the OurGroceries website, and even other types of mobile phones grouped with yours. See items being checked off as your partner shops! You can also keep track of the key ingredients in your favorite recipes and add them all at once to your shopping list. You’re at the Mall busy shopping, our Shopping Calculator would help you to quickly to determine how much you will save on a discount item. You can quickly find out the final price after applying the store’s discount. Our Calculator would also store the data from the last use so you can re-check later on. Shopper is the ultimate application for managing all your grocery and shopping lists on a BlackBerry®. Create any number of lists. Quickly build a shopping list by either browsing or searching for products from the included catalog. Build your own custom items to add to your lists and the product catalog. Reuse your lists for repeat shopping trips. Check items off on your list as you shop. Manage your lists anywhere from the web with Shopper Connect. Share lists with other Shopper users on other smartphones or BlackBerry® and keep lists synced in real time between all recipients of your list. Let family members add to the list as you shop! Manage your lists from the web! Create lists from your phone or from home or work. Just sign in to http://web.myshopperapp.com from your computer and add items to your list. Your BlackBerry® lists get updated in real time. Groupon features unbeatable deals each day on the best stuff to do in cities across the U.S. and Canada. With our BlackBerry® app you can buy deals, access your purchased Groupons, and redeem them electronically. Caripromo is the ultimate app for consumers looking for the hottest deals. Do quick searches on restaurants, electronics, travel and what’s happening in town based on locations, credit cards and various loyalty programs. Find the best promotions, discounts and reviews and share them with friends. From the makers of QuickPull comes QuackBot: the instantly lovable, only partially self-aware deal tracker for BlackBerry® deal-a-day sites have taken the ‘net by storm, and QuackBot is your one-stop window to all the action. This is the ultimate application for managing all your grocery and shopping lists. New update available for free for existing users. 10. GeoQpons – Coupons and Shopping Discounts by XYMOB, Inc. Feature rich, yet simple, GeoQpons is a mobile coupon app for your BlackBerry® featuring deals from over 280 name brands and over 100,000 local businesses. Get access to thousands of coupons, discounts and offers from top retailers such as Ann Taylor, Banana Republic, Best Buy, Sports Authority, JC Penney, Kohl’s, Children’s Place, and many more. GeoQpons app delivers discounts at places where you regularly shop – making it very useful and relevant to you. The app also includes compelling offers from local businesses in your neighborhood. Create Unlimited Shopping Lists & A Master List! Add Quantity And Prices To Your Shopping Lists To Stay On Top Of Your Budget. Easily Email Lists To Yourself, Roommate Or Spouse! Black Market is a small shopping list application that aims to be quick and easy to use and just be not in your way while shopping. It allows you to have as many shopping lists as you need. Items in each shopping list are checked or unchecked with a single click. To allow fastest possible creation and filling of shopping lists, all items once entered are added to an item repository, so you don’t have to type anything twice. 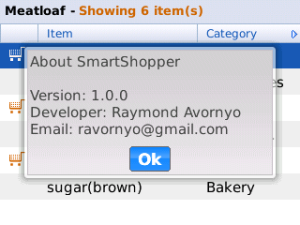 After adding an item once, you can search it in the repository and add it to a shopping list with a single click. The items you add to shopping lists often are automatically moved to the top of the item list, so often you don’t even have to search or scroll to get the item. g|List – we make grocery lists easy! This application is more than just a grocery list tool. It is designed to help you personalize the way you make your shopping lists and improve your overall shopping experience. Creating a shopping list has never been easier! You will be able to enter items in seconds. Can’t remember a particular item? Not a problem! Have a look in the Pantry section and browse through hundreds of typical items you will find at a grocery store. You can quickly search for a particular item in the Pantry. If you can’t find an item, you can easily add it to the Pantry. g|List will save your items in any category you choose for quick access. You can even create your own categories! For those who are budget-conscious you can specify the quantity & cost for any or all items and g|List will automatically update the total cost of your list. Take it to the next level and specify a tax percentage to charge. Even as you shop, g|List is helping you save money…all for the price of a cup of coffee! Shoppening on your phone let you & your friends know what each shop’s offering for you. Don’t miss to get your discount & privilege again.